We have slowly been working on updating different areas of our house. Having a young child, lack of excess money, and lack of excess time are the main reasons that the updates take us so long. Also, there are always other things that need to be done, and honestly, sometimes it is hard to be motivated to do anything once your little one is in bed. 🙂 However, here is the update of our living room and foyer update. So we have been cloth diapering Reese since she was around two months old. We chose to use disposable diapers while she fit into newborn and size 1. The main reason behind that is I didn’t want to have to buy newborn size cloth diapers that we would need a ton of, and I would be washing all the time. If you have never had a baby or newborn, they pee a lot, and lots of times tiny amounts. However, you don’t want them in their own pee or poo otherwise they will get diaper rashes so we went through 12+ diapers a day, and they also have lots of dirty diapers at night as well. Also, at this stage in parenting, the last thing we wanted to worry about was running out of diapers. So, we waited until Reese was big enough size wise to really fit into her cloth diapers; we also plan to do this same approach with our second baby. There are lots of different reasons for cloth diapering, and you really need to decide what they are to make sure it is worth it since there is some investment up front for cloth diapering. Cloth diapering is not for everyone! Also in some areas it is more expensive than others to cloth diaper. For instance, my friend lives in Cedar Park, TX, and they pay almost 2-3xs the amount per gallon of water than we do here in AL. If you plan to cloth diaper, make sure that your significant other is also on board especially before you buy a lot of stuff. Most of our diapers that we got used or brand new were from people who bought a ton of diapers, and then realized that their spouse was not on board. We also chose a diaper that could be air dried so we don’t have to pay to dry them in a dryer. Of course we can dry them in the dryer in a bind,but this also helps keep our diapers looking better since the heat of the dryer can wear out the fibers and materials faster. Are you in it to be green, save money, or use less chemicals on your child? There are so many reasons you can cloth diaper. For us it was money savings, but we started off very very small to see if cloth diapering was even a fit for our family before we really invested a lot of money. Reese in her cute diapers. There are a TON of different cloth diapering types out there some cheaper than others. HERE is a great break down of all of the different kinds out there. We ourselves didn’t try a whole bunch of different kinds of diapers,but we did ask advice from friends who had cloth diapered, and then bought a very small amount to actually test out to see if we felt it could work for us as a family with the least amount of investment up front. We started out buying 7 cloth diapers on craigslist used in the type that we wanted so we could try them out. I found these for around $7-10 a diaper. Brand new on the bumgenius website they are about $20 a diaper, and about $17 new on Amazon. We wanted diapers that were very user friendly, all the same kind and brand so there is little confusion, and as close to disposables as possible. Our other main goal in cloth diapering was to save money since diapers are also so expensive. The best way cloth diapers pay off is if you can get them cheap in the beginning, then you can use them again for more children to really get even more savings, and be able to resell them once you are done with them. Some people get very obsessed with collecting lots of prints, colors, and custom sewn diapers which is perfectly fine,but saving money isn’t going to really happen when you spend that much on diapers. We chose to go with Bum Genius Brand diapers, and we tried three of their versions out to see which we preferred. A picture of two of our types of Bum Genius Diapers. They are one of the few brands that has stretchy tabs which for us was more like disposables since their tabs have more give. This also helps the diaper fit more shapes and sizes of kids. Grovia is one of the other brands that I know of that has stretchy tabs, but we preferred the Bum Genius Diapers. The three different kinds of versions that we tried of the bum genius brand were the Flip, the Freetime, and the Pocket diapers. There is also an elemental version which uses only organic cotton,but this gets very rough and scratchy when line dried which is why these didn’t appeal to me. On the outside they all look the same, we chose to use the cloth diapers with snaps rather than the velcro. The snaps tend to resell better, and the velcro wears out over time. Most of the companies that sell diapers with velcro tabs sell replacement tabs, and that is just something I didn’t want to have to mess with replacing a lot. Here is the inside of the pocket diaper. If I pull open the flap, you can see the microfiber insert. These ended up being our favorite kind because of the flexibility. If you need more absorbency, you just add another liner. The Bum Genius Pocket diapers come with 2 standard liners. A newborn size, and a regular size. You can also buy different types of liners from other companies that are made of say bamboo, hemp, cotton,etc. Some people aren’t a fan of the microfiber inserts that come originally with them. We have never had issues with them ourselves. The larger insert has three snaps on it so you can adjust it to how large or small the diaper cover is set so the liner isn’t too long for it. These diapers will fit Reese until we are ready to potty train. Here you can see all of the snaps undone. To make the diaper smaller, you would first shorten the length vertically, and then snap tighter using the top row of snaps moving toward the center. The second type of diaper is a Free Time or All In One. It is called this because both liners are sewn into the diaper. So you save time by not having to stuff,but it can be trickier add more liners if you need more absorbency. When Reese was really small we liked these a lot because they have a trimmer fit. Here you can see how both liners are attached on one side. So you can fold them in the diaper wherever you want the most absorbency. If you have a girl, people will fold them to have the most in the middle of the diaper. If you have a boy, they tend to have more of the liner in the front. We have a few of these in our stash that we still use,but we much prefer the pocket diapers. The third type is called a flip diaper. I’m not 100% sure that they are sold new anymore,but it is basically a diaper cover that is sold without inserts. A lot of people like these because you can just pull the insert out, give the diaper a wipe down, and replace with a new liner without needing a new cover. Also, some people like to buy the prefold liners which are very inexpensive to put inside of these. With the bum genius liners in it, this is how the inside looks,but like I said above any liner can be put inside. We weren’t a fan as I felt the liners were always shifting and harder to get on with a struggling toddler. Also, the covers cost as much as the pocket diapers to with no liners included. Here is just the cover which can be wiped off, and a new liner put inside. I didn’t like this approach because I felt there were a lot of times that the edges of the cover would get some pee on them. So I preferred to just get a whole new diaper out to use, rather than try and put in a new liner. They work,but just weren’t our favorite. The flip microfiber liner that is sold separately doesn’t have snaps,but sewn fold lines. So if the diaper is on a smaller setting you just fold to the correct height. Here is the back side, and you can see the lines are labeled with Small, Medium, and Large so you know how to fold. The hardest part about cloth diapering is finding a good wash routine. There is a lot of science involved in this step, and it took us a few months to get a hang of it all. Some kids are more sensitive to different detergents, so that might make the process take longer as well. I used this cloth diapering group which is amazing when it comes to finding your wash routine. 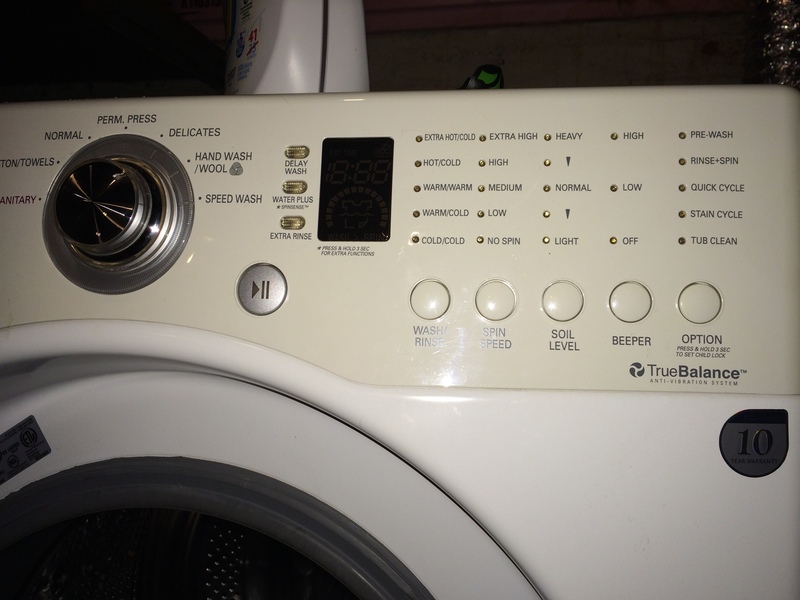 You look up your washer, and they will tell you the correct way to wash. Above is their picture for my machine, and the wash cycle. Just make sure you use a detergent that they have on their approved list. We had issues with too many suds in our machine and kept thinking it was too much detergent. Well, it turns out we had hard water. So we add Borax to each load of diapers and now all is great. We wash our diapers in a front loading HE washer,but I have read that for cloth a lot of people prefer top loading machines. If we ever have to replace our set and are still diapering, I might consider switching to a top loading set. We use THIS rack from amazon to dry our diapers since a lot of the time we dry them in the house, the sunroom, or on our back patio. However, we waited about 3-4 months after diapering to buy this rack to make sure it was worth the investment. If you have an outdoor clothes line, that works really well too, and it can be a lot cheaper. We just didn’t have a great place to set one up, so we preferred this set up for now. In the beginning, I had a few of these homemade cloth baskets to store diapers in. I kept some in Reese’s Room and some in the living room. Now we only change Reese in her room, and since there are more diapers, they are in a drawer in her dresser. There are all kinds of nice ways to store your stuffed and ready diapers. To get maximum savings for diapering, we wanted to be able to wash every other day which meant we needed at least 24 diapers since Reese went through about 10-12 diapers a day. The older she got, the less diapers she used. Right now she is 16 months old, and uses about 6-8 per day. When we first started diapering, we started off with 7,but 12 would have been the perfect number to last through a day, but then we would have to wash right away at night to make sure we had enough the next morning. Storing the dirty diapers is also something that people do differently. You can store them in a bucket or trash can either dry or wet just don’t soak them in dreft or detergent!!! (This is how older diapering used to work,but it will break down the fibers in most of the newer diapers these days.) We started off really cheap. We had an unused trash can that we would use. Later on, we bought this Liner so we didn’t have to keep cleaning out the trash can,but if you are really on a budget the liners aren’t necessary. We have now upgraded to a slow close kitchen looking trash can to keep the smell in that we bought at Sam’s Club. We have the same one in our kitchen for the past 5 years that we are really happy with. When your baby is breastfed, their poop doesn’t really smell and is very easy to get off of diapers. So, all you do it put the dirty diaper straight into the container you store them in until you are ready to wash them. If you use cloth wipes, you leave those in the pail or container as well. If you use disposable wipes like we do, then throw those into a real trash can as you don’t want them going through the wash. I understand using cloth wipes would save us even more money,but we just like the convenience of using disposables. We use THESE wipes because we like them the best, but Aldi sells really nice ones for even cheaper that are very similar if not identical to Huggies wipes. Once your baby starts eating solids, their poop get firmer, smellier, and more of a hassle. You want to scrap as much of this poop into the toilet before washing the diaper so everything can get cleaner. Some people buy a diaper sprayer which are very nice to have,but we waited to buy one because they are expensive. Using toilet paper or a designated plastic knife works just as well. Then once your kid gets a little bit older say over 13 months old, their poop starts getting even more firm to where half the time it will just fall right into the toilet with a shake which is very nice. We now have the diaper sprayer which I use when the poop won’t just fall into the toilet. It is really nice to have now that we have it, but again if you are on a budget you can easily cloth without it. This is a commercial spray pal that you hang the diaper on so you don’t have to hold it while you spray it down with the diaper sprayer. It makes sure that you don’t get dirty water all over your bathroom. It is very nice to have as it sits right in the toilet,but again expensive to buy. You can look up DIY diaper spray pal, and people have genius cheaper options if you don’t want to spend the money. We waited a long time before buying one of these because we didn’t buy a diaper sprayer for a while. So, once you have dealt with getting as much of the poop off as possible, you then remove the liner if you are using a pocket diaper or flip diaper, and throw everything into your container until you are ready to wash. A lot of people get grossed out with the idea of having the handle the poop in cloth diapers. You do handle a little bit more poop,but honestly, if you have a kid you will just need to get used to the fact that you will handle poop no matter what kind of diapering system you use. If you get stains on your diapers, sunning them outside is the best way to remove spots. If you cloth diaper in public while out and about, you will need a wet bag of some sort. This is a waterproof or almost waterproof bag that has a zipper where you can put dirty diapers in until you get home and can remove the poop and store in your trash can ready to be washed. We bought two Planet Wise wet bags in the very beginning. These are the more expensive nicer ones,but we thought when starting out they were worth it. They still are,but Reese goes to School where they cloth diaper her, and so we needed more bags. These bags aren’t as nice as the planet wise,but since she only goes to school for half a day, it isn’t as big of a deal. We chose to buy one larger and one smaller planet wise wetbag which lasted us. In a pinch, you can use a walmart grocery bag,but the smell isn’t trapped as well in it. When we first started out with the least money invested, we had 7 diapers, 2 wetbags(one large, one small), an old trash can to store the dirty diapers in, detergent(We use Tandil from Aldi), and wipes. That system worked for us, and as we started getting more comfortable with cloth diapering we added more and more things to our stash for convenience. Drying Racks can also make great toys of distraction. Right now we have a stash of about 45 diapers which is only so large because we found a lot of them used, and we knew once we were diapering baby #2 we would need extras to keep us on the wash every other day cycle. 1 foot pedal trashcan to store dirty diapers in. 1 drying rack that is collapsible to save space and makes it easy to move around the house. 2 Planetwise wet bags, one small and one large. Tandil Aldi Detergent,but you can use all kinds of detergent, just make sure to check the approved list. Reese showing off one of her diapers. Phew, I feel like there are so many things that I could still cover,but for now I will leave it at this. If you have any questions, please feel free to comment so I can alleviate any confusion. One of the smaller DIY projects that I worked on was painting the “smelly” closet as we called it. No matter what we tried it always had a musty smell to it. So, we decided a fresh coat of primer and paint would hopefully do the trick. This is our main linen closet, and so I was really wanting it to be useable! Our whole house has popcorn ceilings except the closest because who would waste such a high quality texture in a closet?! ;p Our den has painted paneling which was then sprayed with a popcorn texture so that will be fun whenever we try to tackle it. Grant and I are not fans of popcorn ceilings, but they take a long time to get rid of at least in our house. So, I see this being a LONG journey as we slowly depopcorn our house. However, getting rid of the popcorn is very time and labor intensive,but not that costly compared to other home improvement projects so that at least is a plus. There are so many things that we would LOVE to change in our house, but we had to decide which things were the highest on our list of priorities with the time and money that we had. We decided that we wanted to try and update our kitchen cabinets first. We wanted to remove the corner pieces on the doors, reroute the edges, paint the doors, raise the upper cabinets, and update the hardware. Some of these things we were able to accomplish, others didn’t really get to happen, so I will explain what we were able to do, weren’t able to do, and what we discovered along the way.